The A.V. 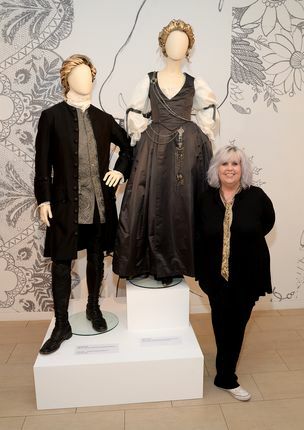 Club has a new interview with Outlander‘s costume designer Terry Dresbach. Below are some excerpts, but head over to the A.V. Club to read this all encompassing interview with Terry. The A.V. Club: How did you get into the business, and how did you end up working on Outlander? Terry Dresbach: Well, I married the showrunner [Ronald D. Moore]. I joked the other day that it was a very convoluted and complicated way to get ontoOutlander, but it works. Really, I got into the business by accident. I was a painter and went to art school for sculpture, and you can’t really survive doing that. Well, you can, but I couldn’t. A film came to town in San Francisco, and I ran away with the circus. I wanted to be a production designer, but as a woman, it’s a hard row to hoe. It’s a very male-oriented area of the business, and costume design is sort of the women’s ghetto. A place you can definitely get in. They don’t have any problem with you being a woman. So there I was. I didn’t want to do the show. I tried to get out of doing it. I tried many, many times, and in many ways. Finally, they just couldn’t find anybody. They were really struggling, and I just knew how huge it was going to be and that you never get enough prep time in television, ever, or movies. This show is so enormous. I just knew it would be the end of life as I knew it. I agreed to come get it started, and that I would be in Scotland for three months, and I’m going on four years now, I think. There’s just no escape. AVC: How much of the clothing are you fabricating from scratch? TD: Everything. We make everything. Well, we rent police uniforms for the ’50s and ’40s and ’60s, or airplane pilots or stewardesses. But everything else we make. If it’s 18th century, we made it. AVC: Are you making your own fabrics or purchasing them? TD: We usually purchase. For Paris, we purchased billions of meters of silk, and then we took it from there. We embroider it, we paint it, we treat it, we do all sorts of things to it. So in a sense, yes, we are making our own fabrics, but we start with a foundation of existing fabric. The tartans we wove. We designed that pattern and had it woven. AVC: How is the Outlander budget compared to other projects you’ve worked on? TD: We’ve been very fortunate. You could not do this show without the kind of support that we get from Sony and Starz, and Ron and everybody. People listen, and on a lot of shows, people don’t listen. With something of this scope and scale, you just have to trust the people who are actually making the product, and it’s nice to be trusted. So we have enough. Interestingly enough, season two didn’t cost that much more than season one. In this business, it’s either time or money. In season one, we didn’t have any time, and things cost more when you’re slamming them together. When you have lots of time, things cost less, because you have the time necessary to do it. So oddly, it cost about the same to make 10 times as many costumes—and much more elaborate and detailed costumes—because we had the time to do it. I always say, “You can make an entire show overnight if you can hire 250 seamstresses,” which you can’t. You can do anything. It’s just going to cost you a whole lot more. AVC: How big is your department? TD: We started out with a department of eight, and we now have a department of 70. As everybody from top to bottom has started to understand, we’re all caught off guard all the time by scale, just how big the show is. It’s always everybody kind of going, “Oh, wow, no wonder.” And because everybody—the film studio, every television studio—is shooting in the U.K. now because of tax credits, all the crew is already working. We’re always in a panic, because that is the one thing that is very difficult to fake. There just isn’t a lot of crew available. We snagged everybody we could with experience, so we have maybe 10 people who have done this before. And then the rest of the department is pulled together from people in theater and a lot of kids right out of art school. You find a lot of talented people out of art school. All our embroidery for season two, that was art students who are savvy and smart enough to know how to do a lot of digital work, and they learned how to become embroiderers. It was quite crazy. AVC: What haven’t you been able to do yet on the show that you’d like to do? Is there an era coming up that you’re excited for? TD: I always wanted to do 18th-century Paris my whole career. And now I have, and I never ever want to do it again. This entry was posted in Interviews, Terry Dresbach and tagged Costumes, Interviews, Season Two, Terry Dresbach by Sarah Ksiazek. Bookmark the permalink.